You just received your awesome monthly package of awesome brand-spankin’-new, quality, fashionable socks. After wearing them (and getting tons of compliments), you’re ready to load up the washing machine. Do you know how to properly care for your new colourful socks? Keep reading to discover our top tips and tricks to care for your sockbox.ca socks. 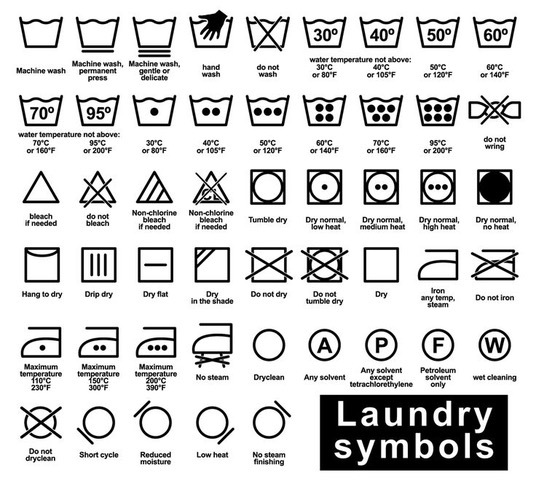 If your folks never taught you how to read the laundry care symbols before you went off to university, don’t worry. These hieroglyphs don’t have to intimidate you! 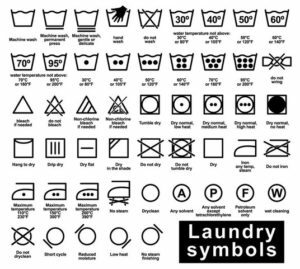 This handy chart demonstrates what each laundry symbol is really saying. Make sure to peep the tag on your socks to check the care symbols on the label – and then follow them. If you’ve tossed the tag away, then a typical guideline of cool water wash, with hang to dry will help extend the life of your socks. Tossing your awesome quality socks into the dryer is a big no-no. Not only are you 100% more likely to lose a mate in a pair, the dryer’s heat can warp and destroy the soft, quality cotton fibres of your sockbox.ca socks. Dryer sheets are also notoriously damaging to socks. Stearic acid, an ingredient in the coating on each dryer sheet, can harm the wicking capabilities of your socks. And we all know that sweaty feet are unhappy feet. Instead, hang your socks to dry on a drying rack and let fresh air do all the work. Once you’ve successfully washed and dried your socks, smart storage will ensure they last for a number of seasons. Rather than rolling them up together, lie your socks perpendicular to each other and then fold. 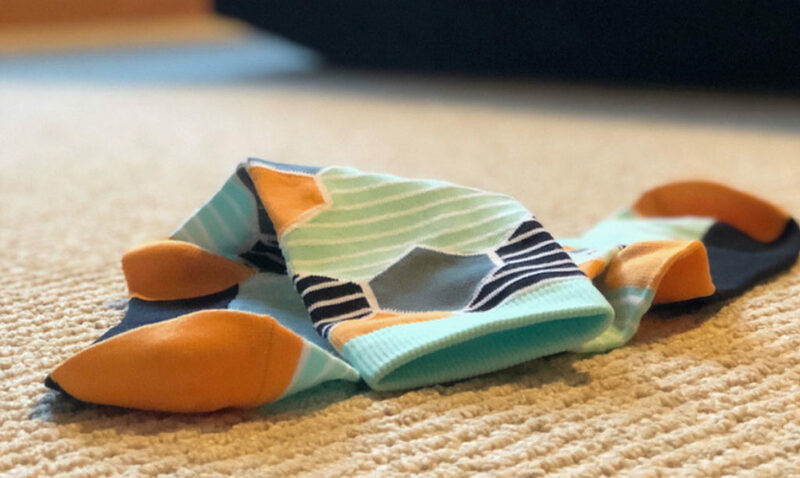 Not only is this way more eye-catching, but it’s a more efficient use of space and prevents stretching sock fibres that the rolling method causes. Channel your inner Marie Kondo and learn how to fold your socks into perfect little origami squares with this handy YouTube video. All the care in the world can’t save your socks from talon toes. Foot care is super important – who wants to be scratched by their partner’s toenails in bed?! Aside from keeping your partner happy, soft feet will keep your socks hole-free for many seasons. Sharp, long toenails will quickly cut holes into the ends of your socks, and rough callouses or corns can wear out the fibres of your sockbox socks. One final thing to note is the cleanliness of your shoes. Obviously cleaning and shining up the outsides is a no-brainer, but did you know it’s important to keep the insides of your shoes clean too? Sweaty feet result in bacteria, and when bacteria hang out in your shoes too long, they can create a funky odour. Remove the insoles (if possible) and apply a mixture of 1 tbsp of white vinegar to 5 tbsp of water gently with a new, clean sponge. Vinegar has bacteria-fighting capabilities. After cleansing, sprinkle in some baking soda to further deodorize your shoes. Just keep these few simple things in mind when caring for your sockbox.ca socks, and you can enjoy a colourful wardrobe of functional, fabulous socks for seasons to come. Have any tips that you think we should know? Let us know in the comments. This entry was posted in Sock Drawer. Bookmark the permalink.